Well who doesn't love some sparkling on her nails. All of us love glitter nails....BUT( there's a big but.....) when it's time to take it off, glitter nail polish automaticly becomes girls worst nightmare!!! !Ohhh yeah ...it goes everywhere when you try try to take it off (grrrr). That's why todayFjola's Wonderland will show you a smart trick on how to get rid off glitter nail polish from your nails. 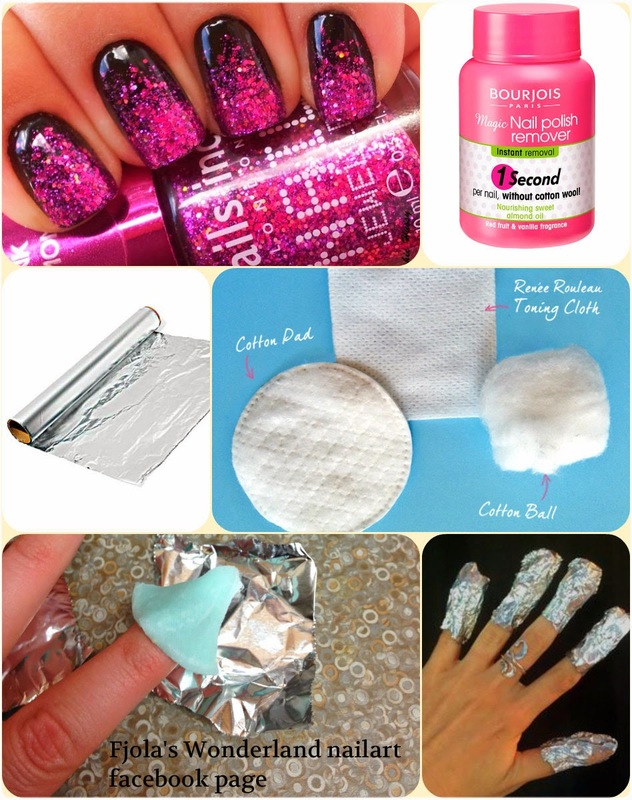 What you will need : An aluminum foil ,your nail remover(acetone)and cotton them. 1) Dip your cotton ball in some nail polish remove. You will really want to soak it because, as you probably know, glitter nail polish is absurdly strong and will cling to your nails for as long as it can. 2) Cut in pieces your aluminum foil. So you can put it later on your nails. 3) Place your cotton ball ( that you soaked into the nail remover) on your nails. Press the cotton ball, saturated side down, on your nail. If you soaked your cotton ball so thoroughly that it is wet all the way through, just stick it on your finger any way you like. 4) Wrap the foil around your finger. Put the aluminum foil over your finger and the cotton ball, wrapping it firmly so that it won’t fall off. Putting the foil on will help to keep the cotton ball in place. 6) Undo the foil and swipe the cotton ball across your nail. With one swift movement you should drag the cotton ball across and off your nail, taking all of the glitter with it. Enjoy your glitter-free nails.